​Figure 3. 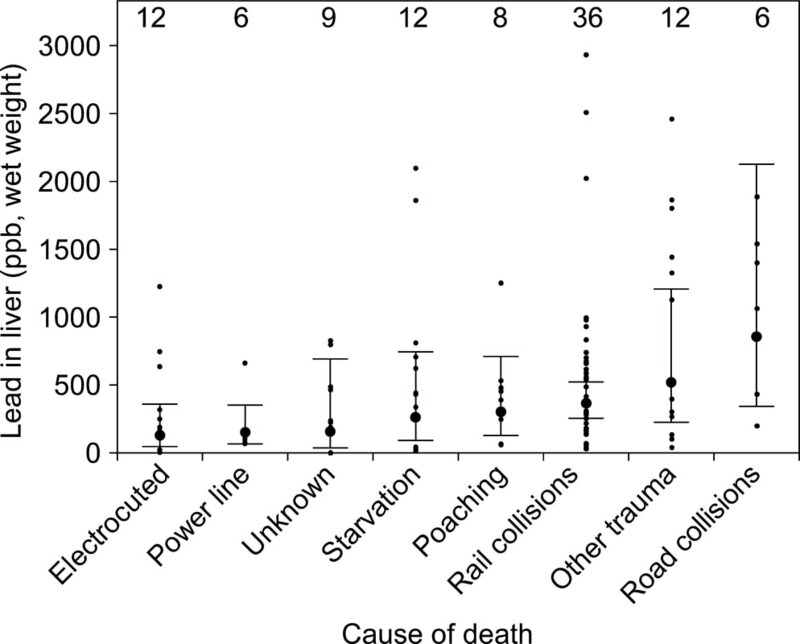 Post mortem lead concentrations in liver of 101 Golden Eagles recovered in 2003–2011 in Sweden. Eagles are classified by cause of death and sorted in ascending order of mean lead content in liver (geometric means (big dots) ± 95% confidence intervals; small dots = individual values). 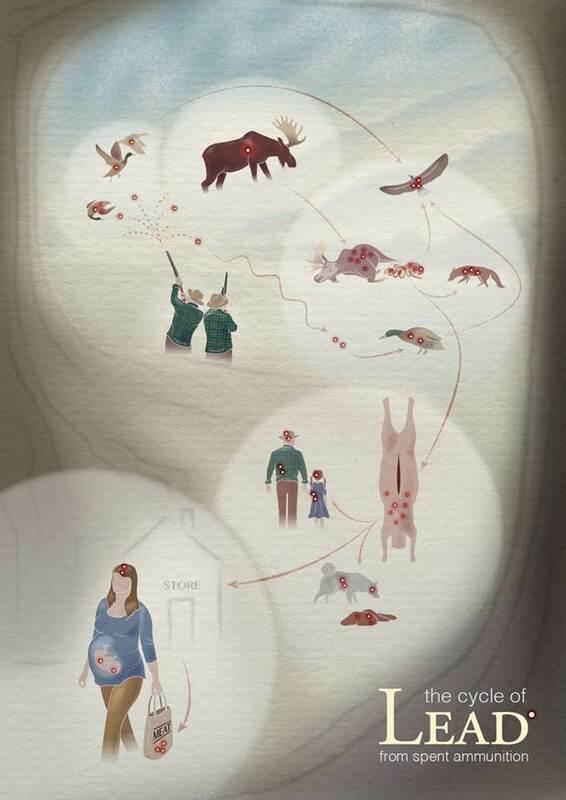 Lead poisoning of animals due to ingestion of fragments from lead-based ammunition in carcasses and offal of shot wildlife is acknowledged globally and raises great concerns about potential behavioral effects leading to increased mortality risks. 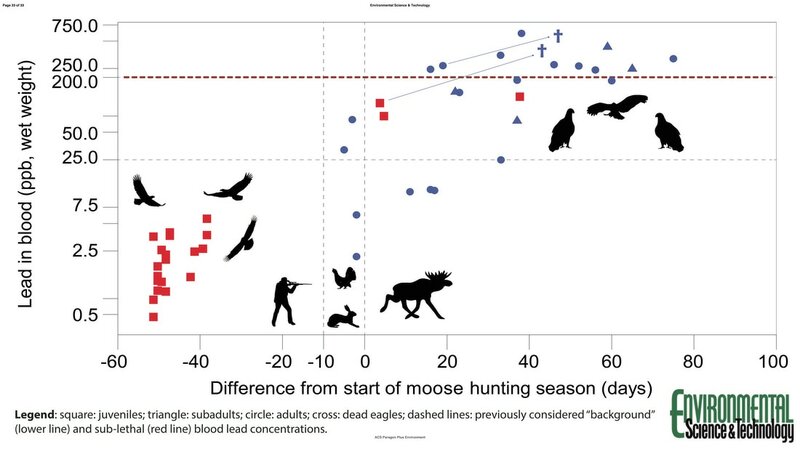 Lead levels in blood were correlated with progress of the moose hunting season. Based on analyses of tracking data, we found that even sublethal lead concentrations in blood (25 ppb, wet weight), can likely negatively affect movement behavior (flight height and movement rate) of free-ranging scavenging Golden Eagles (Aquila chrysaetos). Lead levels in liver of recovered post-mortem analyzed eagles suggested that sublethal exposure increases the risk of mortality in eagles. Such adverse effects on animals are probably common worldwide and across species, where game hunting with lead-based ammunition is widespread. Our study highlights lead exposure as a considerably more serious threat to wildlife conservation than previously realized and suggests implementation of bans of lead ammunition for hunting.